When my daughter shipped off to Virginia Tech in 2007 we bought her a shiny new MacBook, an ethernet cable and a license for Microsoft Office. Back then I was still a Windows guy so I figured she would need MS Office—that's all I had ever used and that was the same for her. Other than a passing interest in the device I let her set it up for herself. Being a newly minted adult and excited about leaving the nest, she wanted to handle it all herself anyway. Not being a techie, she installed Office and depended on the core Tiger version of OSX to get through school, which worked fine for her. In the 3+ years she's been off at school I think I've gotten maybe one or two "technical support" calls from her. Lots of calls for extra money so we knew the phones worked, just not a lot of technical issues. When my middle child—a son starting at James Madison University—needed a MacBook for school I was determined to set it up for him before he took off, giving him some additional software that would make his computing life a little easier. My son is really a non-techie. It's not that he doesn't know how to work a computer, in fact he's a skilled touch typist and uses his computer quite confidently. It's just that a computer for him is a tool, plain and simple. As long as it gets out of his way when he's trying to get work done (by work I mean accessing Facebook) it makes him happy. OS X is a very capable operating system when shipped out in a new Mac, though a couple things require you to intervene before they are actually leveraged. The first thing I did was purchase a small 320GB USB drive for Time Machine use. The last thing I wanted my son to do was lose his work because of poor backup discipline. Most adults don't even think about backups so expecting a teenager that struggles with basic cleaning and laundry principles to do it is ridiculous. I walked through a couple of scenarios with my son, telling him how bad it would be if his data was not backed up and his drive failed or his MacBook was stolen. All he had to do was keep that USB drive plugged in when it was sitting at his desk and he would be fine; Time Machine would take care of the rest. 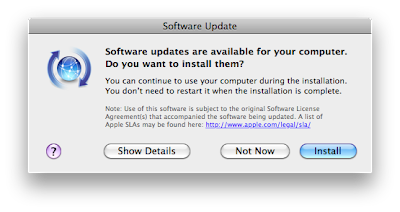 they simply click the "Not Now" button or close out Software Update completely. I tried to impress on him the importance of keeping his software current and that he should avoid delaying software updates for more than a couple of days. I have no idea if he's actually keeping his Mac current but I'm hopeful. While Time Machine did its magic and was ensuring his entire Mac was properly backed up, I wanted to make sure he had another tool at his disposal to ensure his documents and class papers were safe. By far one of my favorite utilities, DropBox integrates seamlessly with Finder, synchronizing the "DropBox" folder with a virtual drive up on the web. The advantage is that not only are your documents safely tucked away on yet another medium, they are also accessible from a remote computer by logging in to your DropBox account. The advantage of having access to your key files while you are away from your own computer is huge, potentially saving him the time of having to run back to his dorm room if he forgot a file. The fact that versioning is supported by DropBox also means that he has at least some history for the document in case he needs to roll it back and there was a problem with Time Machine. As I set this up for my son I noticed that his roommate—packing a Dell laptop running Windows 7—didn't even have a backup system set up. I hooked him up with the Windows version of Dropbox. I highly recommend Dropbox to anyone whether they are running OSX, Windows or Linux. A laptop isn't just for work while sitting in a dorm room, it's often used to entertain as well. I've observed my son watching video clips on YouTube, LiveLeak, etc. and having to constantly tap the touch pad area to keep the Mac from dropping into sleep mode. By clicking on the little coffee cup icon in the menu bar Caffeine will keep the Mac from dropping into sleep or screen saver mode in the middle of a passive activity like watching a video clip. Another great, free utility and it's now installed on every Mac we have. Free tools are great and another one for a Mac (or Windows machine for that matter) is Skype. Though we talk to our son on the phone pretty regularly having the occasional video chat through Skype makes it feel like he's not really that far away. My wife loves seeing our son's face every once in a while too. Skype was one of the utilities I was glad I set up before we left the house for school. I could confirm he had his account set up correctly, and we were able to add each other to our Skype directory and make a quick test video call. While Skype has the option of auto-loading when the Mac is restarted, my son wasn't too keen on that feature. "How about we text one another on the phone and set up the Skype call?" I've been a big fan of Pages for a while now; it's a great general purpose word processor that fits nicely into the Mac environment, unlike the Microsoft offering. Though the .pages file format is hardly universal Pages itself can save most simple files into a DOC format. For the kinds of papers my son will be producing, which will sometimes include images embedded into the documents, Pages works great. Keynote is easy to use and produces some really beautiful presentations, though this is not something my son (nor my daughter before him) have had to use extensively. Numbers is the third leg of the iWork stool and is adequate for very basic work but falls far short of what any power user of Excel is used to. That said, it's serviceable as a basic spreadsheet. Getting all of them in a Family Pack that can be installed on up to 5 Macs in the same household makes it a very cost effective purchase. As an alternative to iWork you may want to consider some of the great free alternatives out there. NeoOffice is my favorite; it performs reasonably well, can open and write to most of the standard DOC, XLS and PPT formats and comes with a UI that doesn't look completely odd on a Mac. Safari is a fantastic web browser right out of the box so I encouraged my son to use it, even though I personally alternate between Safari and Firefox for development reasons. As far as e-mail, my son's school and personal e-mail accounts are both accessible and very useable from within a web browser. Rather than set up and try to remotely support Mail.app I figured he would be fine using it through the web. Though my son's MacBook was of course WiFi equipped, some schools don't have WiFi available in the dorms and actively discourage students from setting up a Wifi network themselves—JMU is one of those schools. Always give them an ethernet cable and get a minimum length of 25'; sometimes the ethernet jack is on the other side of the room from where they will want to set up their desk. Bringing along a couple of power strips and extension cords is also a wise move. The last thing we did before leaving his dorm room was set him up with a very inexpensive ink-jet printer and throw some spare ink-jet cartridges and a couple reams of paper into a drawer. Fortunately the MacBook recognized the printer as soon as it was hooked up. Once a test page popped out my son started to get a little anxious for us to leave. "It's all set Dad, I'm good. I've got stuff to do!" We began an awkward transition; my son clearly wanted us to leave so he could start the activities JMU had planned for him. My wife and I kept shuffling around the dorm room, trying to make sure we had everything covered, delaying the inevitable goodbyes. When that moment finally arrived we got through it as quickly as we could. He hugged my wife, gave me a huge bear hug, then we quickly headed out the door. During the long drive home my wife and I tried our best to be upbeat and happy for our son. Our little boy was now an adult, having to handle things on his own without his parents standing around him. He had a well stocked dorm room, his xBox, a mini fridge full of sodas and a shiny new 13" MacBook Pro. He was ready. My iPhone rang. It was my son. "Uh Dad? I can't get on the internet." A quick reboot later and everything was working fine and he hasn't had an issue since then. Still, it was nice to know he still needed me. Is there an application or service you think a Mac wielding college student must have in order to get started? What did I miss? Please drop a note in the comments. Hi David, when I was at college I found a nice little application to help me with referencing when writing reports, essays and my dissertation. Saved me alot of time. @Ryan: Wow, Reference Tracker looks cool - thanks for the link. Love the integration aspect with Pages, Word, etc. David, all respect to the developer of Caffeine, but there's a built-in solution in Snow Leopard that requires no resident program to be running. I have mine set up with: TopLeftCorner=Screensaver off; TopRightCorner=Screensaver activate; BottomLeftCorner=show desktop; BottomRightCorner=show all application windows. Over at www.ehmac.ca (Canada's Mac User's Forum) we have a great troubleshooting forum, including a permanent thread on setting up a new Mac, which might make for interesting reading. @Zacaman: This is why I encourage comments (and that people read them). Didn't realize I could do that in the Screensaver preferences! Thanks for the great tip. One of my favorite tools is a writing application called Scrivener. Meant for novel writing, its keyword tagging, outlining and research storage works great for work projects, class notes and documentation. A task manager called Things is also pretty darned useful. Neither are free, but both can help you stay organized and really change the way the way you work. 1Password is a great way to store passwords and important data securely. It works on Macs and iPhones etc and uses DropBox to sync. I'll second the recommendation of Scrivener. For keeping track of references, I'd suggest Zotero (www.zotero.org): it's free, and makes it really easy for collaborators to share references. I couldn't work without it. Right now it requires FireFox, but that will be changing: http://www.zotero.org/blog/zoteros-next-big-step/. One big recommendation I make for college bound kids is to get them their computer for HS graduation (i.e., 3 months before college). That way, if you are the 1 in a million where the laptop is DOA, you have time before class to fix. Also, many kids are switching to Mac from Windows and the extra "pressure off" weeks allow them to acclimate without panic attacks from deadlines. David, My idea is to keep everything browser based, including office apps by using Google Docs, Zoho, and even MS Office online. Backups are no longer needed and the desktop is simply a terminal. If the laptop crashes or not with you, grab another one and have everything accessible. The only app I can think of is Skype, which replace the need for a cell phone. Everything else is included on a new laptop. @billm: My 5 year old already has her own MacBook for kindergarten. Its only a refurbished one I bought for $200, but still more functional than most 1 year old PC's I've seen. Its amazing how different the world is for the younger generation. I'm sure she'll be on her 3rd or 4th by the time she starts college. I use Evernote everyday for research note taking, its free, cross platform and syncs effortlessly, will even do text recognition from photos of notes, if you store a lot of pdf's the premium account is worth it, if not the free version is great, also has iphone/ipad app and access via the browser. You can also share notebooks with other people read only or read/write. Finally, you might want to get him to start using iCal or BusyCal. Student life can become hectic really fast! Some great feedback in here - thanks! 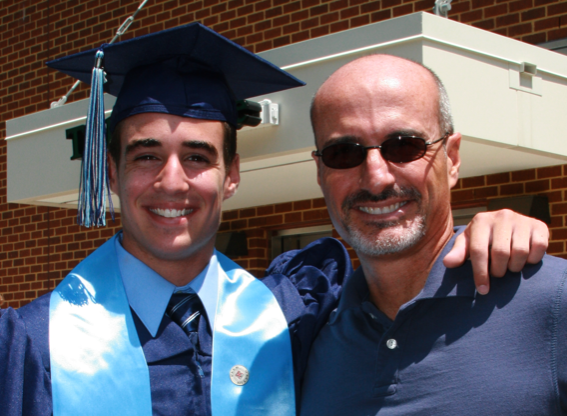 This will help when I ship my third (and final) child off to college in a couple years. @fortyrunner: I love 1Password! Unfortunately I couldn't get my son to actively use it on his Mac Mini so I didn't bother trying. He's young and his brain hasn't started to atrophy like mine so I guess that's why it didn't matter to him as much. That said, I'll reiterate: I love 1Password! @paul7: My biggest problem with iChat is that it really is only Mac to Mac for video. Screen sharing on it is FAR superior to Skype's presentation only sharing. Though we're all on Macs we still have some die-hard MS Windows users that I haven't been able to convince to switch yet. Grandparents are now synonymous with "meh" when it comes to change. My son isn't using iCal right now, instead using his non-iPhone POS mobile phone to serve as his calendar and alarm clock. If I was willing to pony up the additional expense of an iPhone for him (NOT), then I would encourage iCal use. @Fred: Thanks man! I really appreciate the kind words! I differ from Jason in that I strongly resist this move to web-based applications like Google Docs... perhaps it comes from so much time working in the developing world, and/or very rural, but I like to have everything on my machine. I recall many flights and bus trips during which I managed to empty (!) my Mail inbox. Something I could not have accomplished if I were dependent on a constant-on internet connection. LIke Paul7, I'm a big fan of iChat (especially when enhanced with the free add-on CHAX). It's amazingly useful for long-distance tech support with non-techie relatives. Unfortunately, some schools and universities have taken to blocking the AIM protocol to cut down on students chatting... which also shuts down iChat completely. And the lack of a Windows client, or at least interoperability, is something I'm surprised Apple still hasn't addressed. I doubled the last few years as a tech writer and grad student, so I very much used Copypaste Pro (or any sort of multiple clipboard tool, handy when writing--takes a while to get the hang of such a tool), and SizeUp (handy when I wanted to have the browser shifted up or to the left with my working document low or to the right). Fred Stutzman's Freedom is a good app when I need to turn off the wireless access for a bit and focus on my work. Skype's advantage is compatibility with standard phones. A $30/year plan allows unlimited outbound calls to any US and Canada number, which minimizes the need to for a mobile phone. Google Voice and Chat is another alternative, as that now allows you to call phone numbers and receive calls directly from the browser, free of charge. @Zacaman: Good point about the Internet dependency. The laptop will be useless without a connection. However, most universities I've seen have wireless available on campus. If the student often travel outside of campus, most students will not want to pay for a $60/month Mifi subscription. I use the KeePass w/DropBox method for storing passwords and keeping the password file synched with multiple computers. Doesn't have the nice browser tie-in like 1Password, but it's free. I switched to Mac in 2009 and your blog was a key guide in the process. I now even have one for work. Thanks for sharing!!! I love Pages, Numbers, and Keynote, however their MS document compatibility is quirky enough that if your school or office is MS based then the experience will be subpar unless you invest in Office. My workplace is MS Office based and although I've tried using Pages and NeoOffice, I end up having to revert to another Windows computer for heavy editing of those files. A Mac-using co-worker with Mac Office fairs much better. Pages exporting to .doc might be fine for standard papers, though. Inevitably I'd probably be submitting papers as PDFs (of which the Mac experience in creating them is far superior.) Basically, if you're having to edit and exchange MS Office files with other people you'll really want Office or else will suffer file incompatibility headaches. Hi David, a Mind Mapping software like XMind (http://www.xmind.net/) may be usefull for a student. I'm in a similar life-phase with kids starting college. We've had both PCs and Mare computers in the house for a few years now. I thought my non techie kids would gravitate to the Mac but they never did, so I've sent them off with PCs. EverNote is probably another good app for Mac users to consider. I went back to school myself a few years ago and actually made a little youtube video about a particular combination of tools that I liked for academic writing. David, great blog post and helpful comments too. One hardware addition (maybe you did anyway): when I helped my daughter set up her macbook, I also got her a powered USB 2.0 hub - so whatever peripherals/drives could plug into that and only one plug into the MacBook, to make it easier to liberate it to travel. Jumpcut: Clipboard history. Like an infinite clipboard. This app is free and totally, completely invaluable to me. Skitch: Very very very easy to use image app. Easy screen capture. Easily add text. Easily export (drag to a folder - done!). Awesome. Cinch: $7 app. Kind of like the new window resize thing in Win7. Drag a window to the top and it goes full screen. Drag to side and it goes half screen. In case anyone come across this on Google, I've stopped using Cinch and now use Shift. It's all keyboard based and free. Both of which I like. its really an excellent post.All the information in your post are awesome.Thanks. Thanks for your good and wonderful article. nice reference. I like it very much. nice .